The Moray Fields site has a varied history, from its first establishment as a cotton plantation in the 1860s through to today. 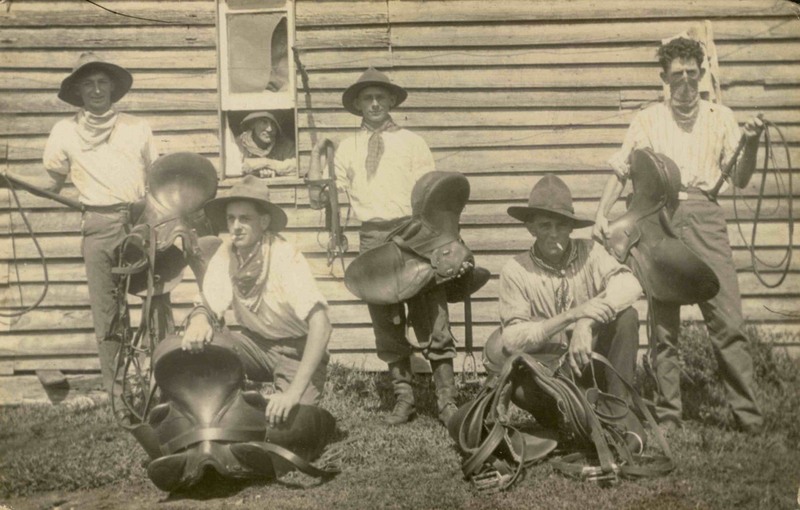 This historical chronology has been formed from research into historical newspapers, published articles and supported by the entry in the Queensland Heritage Register. The Cabulture Cotton Company is formed by a group of settlers including George Raff, William Hobbs, Shepherd Smith, Robert Douglas and John Bramston. In June the founders of the Cabulture Cotton Company sailed in the Breadalbane to explore the shores and rivers of Moreton Bay with the intention of selecting land for the purpose of growing cotton. After three unsuccessful seasons growing cotton, the Cabulture Cotton Company put the property up for sale. 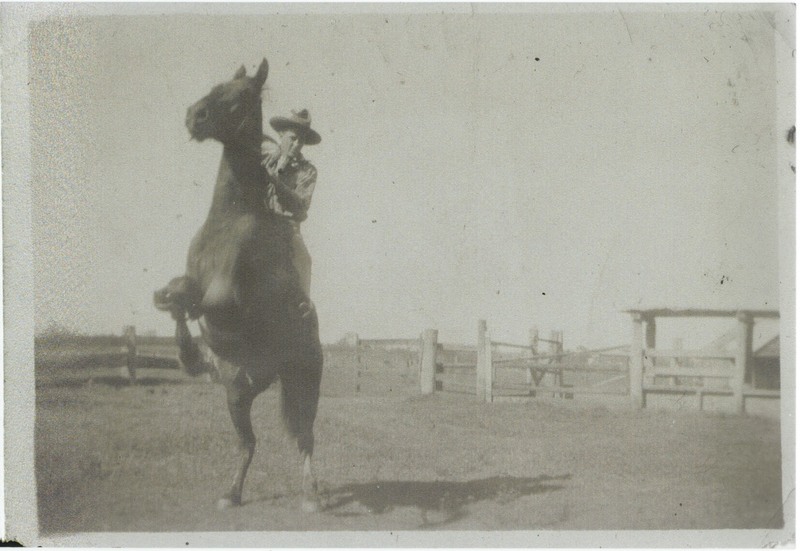 George Raff purchased the land for ￡1,000 and commenced operations on the property later that year. The title for the purchase was not, however, issued until March 1866. A 3ft gauge private tramway measuring ½ mile in length was erected to transport cane harvested from nearby fields to the mill, and sugar to the plantation wharf. Tramway carts were hauled by horses. Sugar cultivating, processing and distilling operations were well established. One hundred and fifty acres were under sugar cultivation. The entire plantation though consisted of 2,500 acres deep black alluvial soils. The processing building measured 120 feet square, 20 feet to the eaves, with a pyramidal roof rather than steep, centred around a 30-horse beam engine worked from a large multi-tubular boiler, fitted with a patented injector. The tramway was expanded, measuring 1.5 miles in length and had a branch line from the mill to the wharf. In November, Raff engages 50 Islander labourers that have brought into Brisbane by notorious blackbirder Ross Lewin aboard the wooden barque sailing ship King Oscar. The Reverend Dunmore Lang visits the plantation and writes about what he sees in the Brisbane Courier. He describes the sugar operations in some detail and notes the presence of 65 Islander labourers who speak 5 different languages. One hundred and ninety (190) acres are under cane cultivation. Rum is being distilled. Over 18,000 gallons had been producted by the plantation since 1867. The tramway measured 2 to 3 miles in length. The original timber rails were being replaced with iron rails. Raff is so proud of his tramway that he displays some of his tramway machinery at an exhibition in Brisbane. In January, accusations were made about Raff not providing good conditions for Islander labourers after several Islander men fled the plantation and were brought before the courts. They were ordered back to the plantation, but refused. 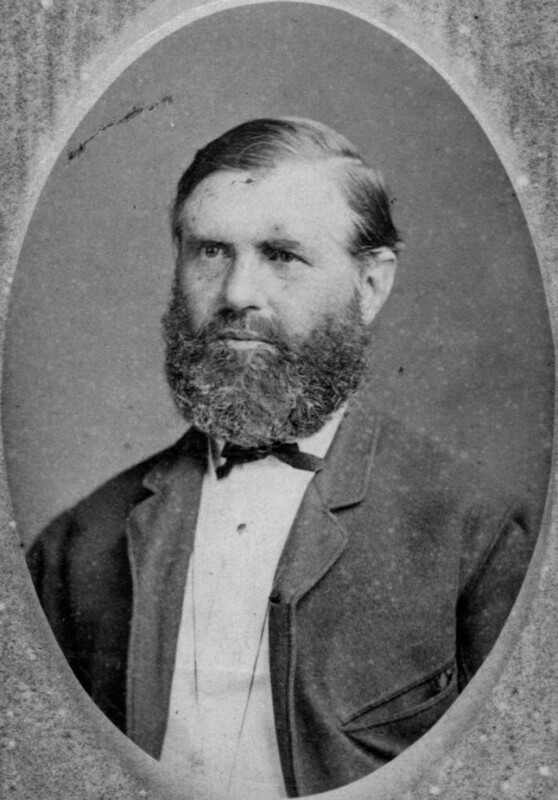 In August, plantation owner GeorgeRaff gives evidence to a Select Committee formed to investigate the operation of the Polynesian Labourers Act of 1868 , noting that he was employing 40 Islanders on the plantation. 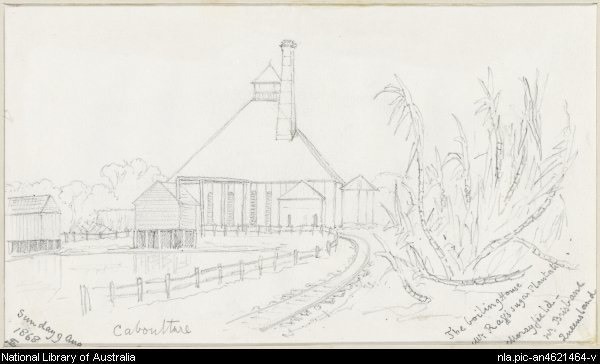 In October, plantation labourer Levi Walker drowns in the Caboolture River. He is buried on the plantation grounds. Forty-one South Sea Islander labourers employed by Raff on Moray Fields returned to their home islands. They had completed 3 years of service. 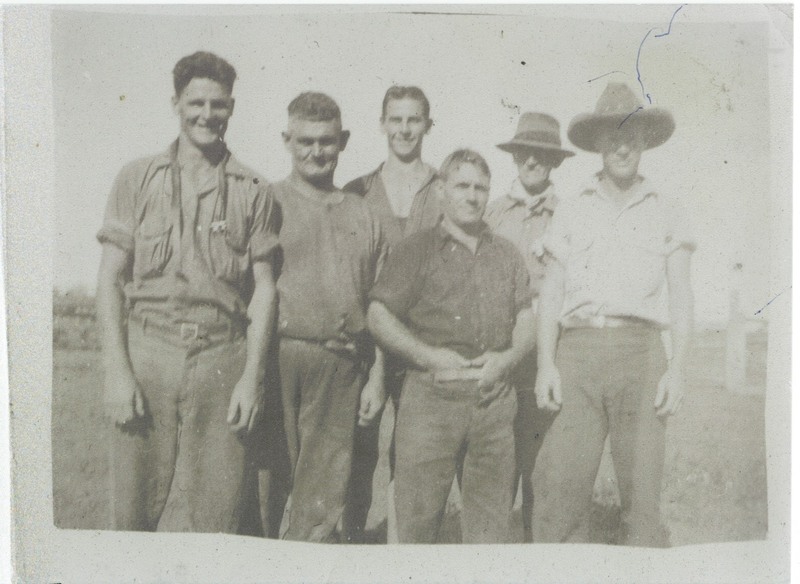 Raff engages more Islander labourers on the plantation, including three boys from the “Sandwich” Islands. 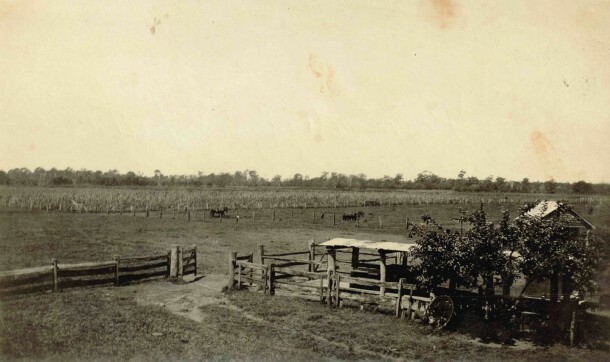 Moray Fields was one of only two distilleries in constant operations south of Maryborough. South Sea Islander labourer from Moray Fields, two years into his contract, was fined 40 shillings in a Brisbane court for deserting his employer. Moray Fields is described as one of the largest sugar plantations in Queensland, with about 200 acres of land cleared of which 180 acres was under sugar cane cultivation. The plantation was being managed by George Raff’s son Robert. About 60 acres of cane at Moray Fields, 40 acres of prairie grass and 3,000-4,000 acres comprising the remainder of the estate are for cattle and horses. The plantation includes a dwelling, mill house, two bonded stores, bone house, carpenters’ shop, cotton shed, stable, octagon building, Islander labourers outhouse, bakery, managers’ dwellings, store, Islanders house, eight cottages, hayshed, schoolhouse, kitchen and stables. Cane cultivation and rump production has ceased. No rum was produced by the Moray Fields distillery . The Caboolture River floods though no damage is noted at the plantation distillery . By August the distillery remained closed. Plantation owner George Raff dies on August 28 at his Brisbane home ‘Moray Bank’, located in New Farm. Ownership of the plantation transfers this his surviving sons – Alexander, Robert and Henry. Tenders are released for the sale and removal of the plantation sugar mill. A Mr and Mrs Jackson and family, take over the ‘South Moray Fields’ house, the residence of the late George Raff . Former plantation lands are sold to William Henry Jackson. A storm carries away half of the roof of the main house in December, landing nearly 300 yards away in a paddock. Land is subdivided into paddocks, most of which is used for dairy farming. A dip and dairy shed is built. 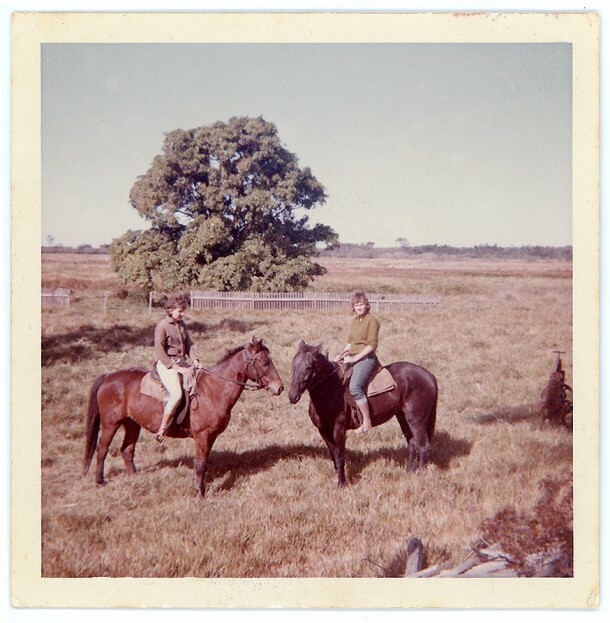 Jackson renovates what is then referred to as “Morayfield House” and uses the land for dairying and cattle breeding, about 400 in total. Eighty acres of the land is kept under cultivation. Land is sold to James Buchanan. Dairying and some cultivation continue. Buchanan is credited with the largest milking herd in the Caboolture district with over 500 head. 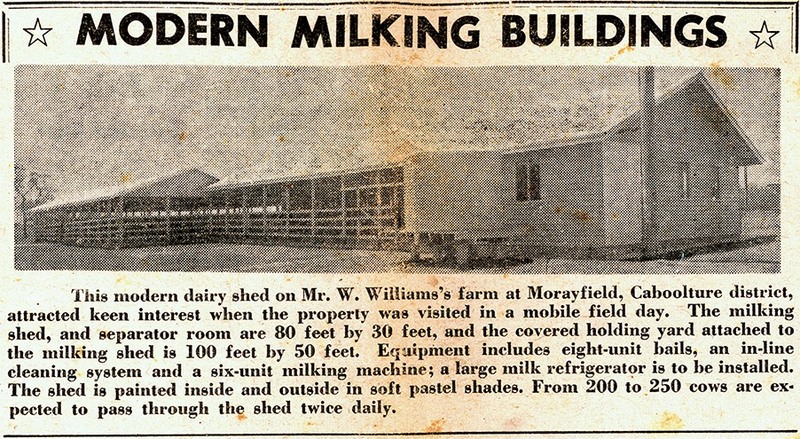 Though milking machines were yet to be installed, the dairy had 41 bails. 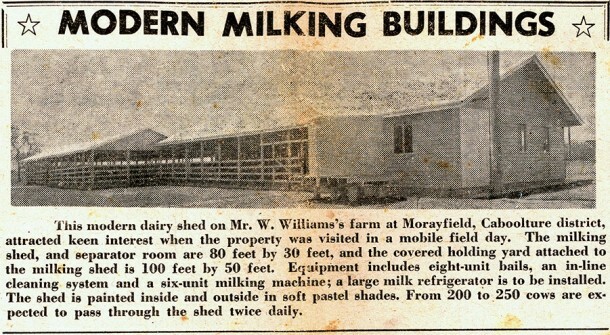 The dairy was being worked on a share system with G.W. Newton. Cream was being taking to the Caboolture Butter Factory. Pigs were also being kept in great numbers with a herd of 200 head on the property at this time. The remains of the former sugar mill still survive, including concrete engine beds, vats, wells, and various foundations. Close to the river bank is a circular structure said to have been the living quarters of Islander labourers. Moray Fields is noted as a successful ‘mixed farming’ property. 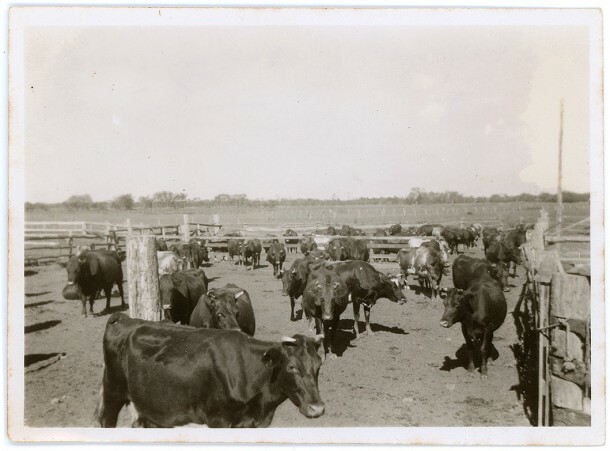 Buchanan has a herd of 200 Illawarras on the property at this time, though other crops are noted to be grown by the share farmers, including a large plot of Soya Beans. Buchanan sells the land for ￡14,000 to William George Currant. Land is sold to Charles Thomas Williams. The land is used for dairying and some limited cultivation. The William family grows up on the site and with a number of share-farming families. The farm was flooded. A new farm house complex was built to the west of the old plantation area and up on a rise to ensure it couldn’t be flooded. The former plantation owner’s house was therefore abandoned and demolished soon after this due to severe termite damage making it unliveable. The land comprising the original Portion 10 is purchased by A.P.M. Forests Pty Ltd for conversion into a pine plantation. During their ownership, many of the remaining plantation-period elements are removed. The land is identified as a potential site for the development of a business park. Northeast Business Park Pty Ltd is established. 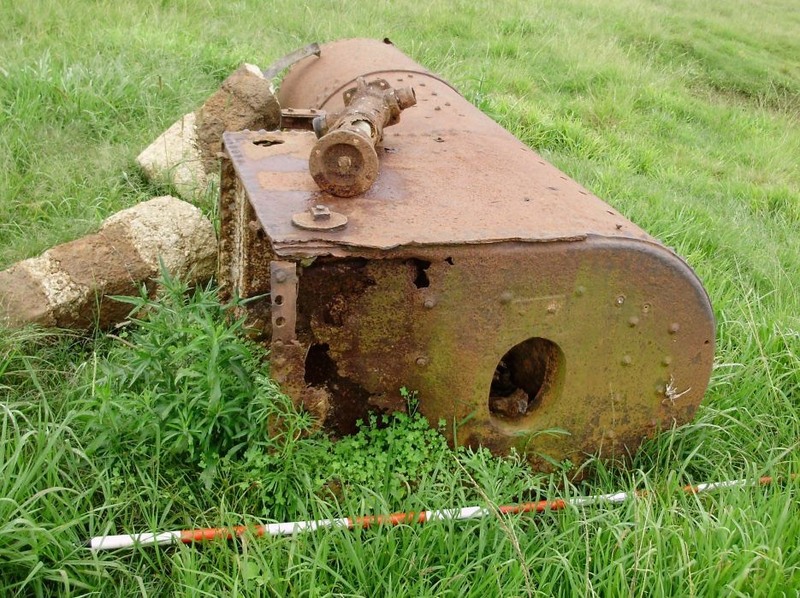 The surviving remnants of the former plantation were recognised for their heritage significance and protected through inclusion on the Queensland Heritage Register in 2010 as an Archaeological Place. Leighton, Stanley 1868, Morayfield, Caboulture [i.e. 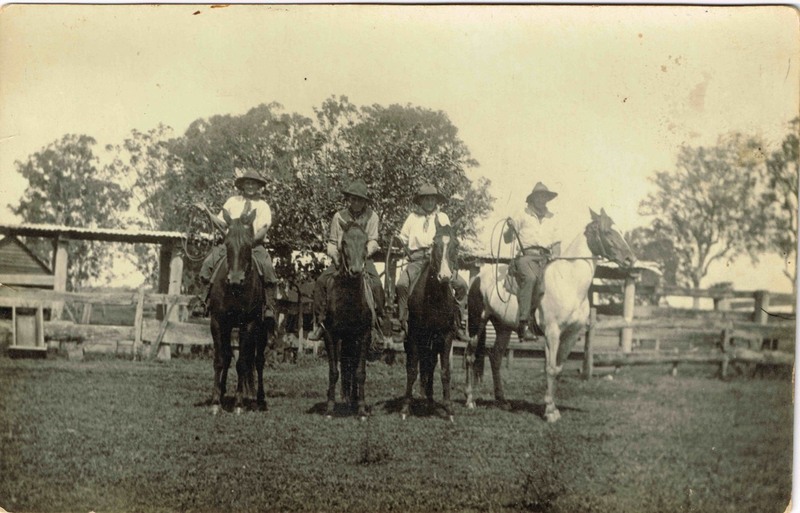 Caboolture], Mr. Raff’s nr. Brisbane, Queensland, Sunday 9 Aug. 1868.